We all take water for granted. Even though water is critical for human life, ecosystems and as a major process or product input for industry, it’s a resource that very few of us think actively about managing. We need to collectively develop new ways to manage water. Now then is a perfect time to consider better, perhaps even radical, approaches to the design, management & conservation of this vital resource. How could we, as emerging standards are suggesting, move towards net-positive or closed loop water systems where all water in a building is “captured, treated, used/reused and released clean within the boundaries of the building”. Buildings as water cleansing facilites rather than buildings as water polluting facilities? On Wednesday 11th March Green Vision will be hosting the second is their Construction and Assemby spring series focussing on a number of current approaches to help us better understand the water challenge and to improve our thinking around water design, management & conservation. Our speakers for this event will be Louise Walker, Innovation Manager at water@leeds who will be talking about how we can better incorporate water into our thinking for new buildings & retrofit to help improve water quality, reduce flooding, provide water resources & create better places to live. This sounds ambitious but it is all part of the concept of ‘Water Sensitivity’ and has been embraced through initiatives such as Water Sensitive Urban Design (WSUD) in Australia. Currently, water management in the UK is compartmentalised & surface water management in particular is not prioritised. 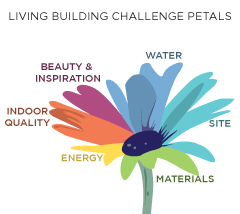 How can we improve the situation and will the Water Petal of the Living Building Challenge help? Last Wednesday, 11th February, we hosted the first in our Green Vision Construction & Assembly Series, a lively event focussing on Learning from Nature introducing the concepts of biomimicry and biophilic design which generated much debate and food for thought. I think it’s fair to say we all left having learnt something new… even it is was purely the existance of dog vomit slime mould as a building tool! Our combined write-up & storify of the event is detailed below although we encourage anyone interested in this topic & themes around it to get in touch with the team to carry on the debate. Also follow the hashtag #gvis2015 to join in the discussion online. Or, at best, we will maintain current levels of consumption which we know is already too much (three planets to much). Coupled with the fact that we all need to pay the mortgage, feed ourselves and our families and put clothes on our backs; how do we continue to prosper on an economic basis, reduce our environmental impact and have a positive social impact (through our buildings in this instance)? My stats on this will be slightly wrong but there are roughly 250 projects that have achieved Net Zero or Petal certifications. But no one has achieved the Living Building Certification. So, what’s so good about this standard? For me it’s the philosophy of buildings being restorative rather than just ‘less bad’. To get the top slot you have to generate 105% of the electrical energy consumed by the building, treat and produce 105% of the water consumed and you can only build on brownfield sites (unless you can demonstrate an educational need to be fulfilled). There are more challenges, but these three examples highlight the point of the restorative philosophy. Simply put, you are putting more energy and water back in than you take out. Building on a brownfield site is a brave move for any organisation as there will be a number of issues that will not be attractive; hazardous waste to deal with (old gas sites for example), run down surrounding areas, potential issues of crime to name a few. But what better way to have a positive impact on society than to build a building (and surrounding biodiverse area) that is a shining example of what can be achieved by individuals who want to make a difference? Sitting within the Estates Team at Leeds Beckett University we are continually pushing sustainability. All of our contractors are achieving recycling rates of 95% plus and energy efficiency is a key factor in all designs. We have made it clear that we want investment appraisals (not cost savings on the project budget) and every option is considered from a whole-life-costing point of view, we specify recycled content in materials (information on this is surprisingly scarce when you dig into the detail) and space options are filled down to ensure buildings are the right size for their purpose. We’ve achieved BREEAM (Building Research Establishment Environmental Assessment Methodology) and Passivhaus standards and everyone is pleased. Rightly so, but… I’m hoping we get the go ahead for a building that will get us the Living Building Challenge full certification for the Leeds Sustainability Institute. If we get the go ahead I’m looking forward to challenging current standards and taking my team, the wider estates team, and the design team on an educational journey that will be continued by our post graduate and research teams as well as the people who use the facility. The New Zealand Education Act specifically states that one of the purposes of a university is to ‘be the social conscience and critic of society’. A building built to such high standards is a good public statement of this purpose. There are already some good examples around, with one of my favourites being the Packard Foundation HQ. Restorative has to be the way to go. To the construction industry it must seem like the vegan equivalent for building standards but after the Living Buildings Challenge there is Biomimicary………and the truly organic building. 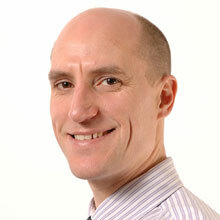 Mark Warner is the Sustainability Manager at Leeds Beckett University. He works within the Estates Team advising on sustainable construction, energy efficiency/carbon reduction, sustainable transport and sustainable purchasing of goods, services and materials.